Back in 1991, John Carpentieri decided to move from Italy to the United States, in search of the American dream. 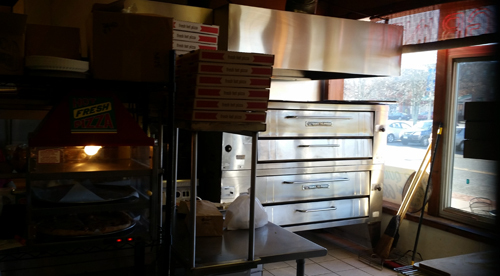 With hard work, desire, and strong family support, Family Pizzeria was opened in the Spring of 1996 in downtown Windsor, Connecticut and has been serving the communities of Windsor and Bloomfield ever since. One of the many reasons for our success, is a long-enduring New York-style secret family recipe that utilizes freshly made dough daily. Our pizza was so divine, that folks came from far and wide to sample our delicious pies. That little pizza shop could hardly keep up with the demand. Customers were literally lining the sidewalk, waiting to taste "A Slice." Today, Family Pizzeria still sits on 181 Broad Street in Windsor. Come by to pick up a pie today or have it delivered. Check out our menu for a complete listing of our other fine Italian offerings. Buon appetito!